Senator Gordon Smith addressing the UVSC student body on the subject of suicide prevention. Gordon Harold Smith was born on May 25, 1952 in Pendleton, Oregon, moving in 1954 to Washington D.C. when his father accepted a job as Assistant Secretary of Agriculture under Ezra Taft Benson. Gordon served a two year Mormon mission to New Zealand in 1971, graduating from Brigham Young University with degrees in history and English in 1976, and earning a law degree from Southwestern University in 1979. After working as an attorney in private practice, Smith assumed management of his family's frozen vegetable processing company, a position he held until his election to the U.S. Senate. Senator Smith and his wife, Sharon, have raised three children, Brittany, Garrett, and Morgan. They maintain homes in Pendleton and in Bethesda, Maryland. Smith is a second cousin of current Congressmen Mark Udall and Tom Udall and is the lone Republican. On September 8, 2003, Smith experienced a personal tragedy when his 21-year-old adopted son, Garrett, a college culinary arts major, committed suicide. In an effort to deal with this tragedy, Smith published a book entitled Remembering Garrett, One Family’s Battle with a Child’s Depression. In 2004, President George W. Bush signed the Garrett Lee Smith Memorial Act, authorizing $82 million for suicide-prevention and awareness programs at colleges. Smith's foray into politics began in 1992, when he was elected to the Oregon State Senate. His colleagues recognized his leadership abilities by electing him Minority Leader, and then President of the State Senate during his first term in office. He served from 1993 to 1997. After being sworn in to the United States Senate on January 7, 1997, Gordon Smith quickly earned a reputation as a statesman with an independent streak. Senate leaders recognized his abilities and continually asked him to serve in key leadership and committee positions. He has also become known for his ability to cross party lines in the interests of his constituents. Smith served in these Senate committees: Commerce, Science and Transportation; Energy and Natural Resources; Indian Affairs; Finance; and as Chairman of the Special Committee on Aging. In addition, he was a member of the Senate Western Water and Rural Health Caucuses as well as the Chairman of the High Tech Task Force. Smith was also co-chairman of the Senate Task Force on Medicare and Prescription Drugs and was selected by leadership three times to be a Deputy Whip. Smith was a strong supporter of expanding hate crime laws to encompass crimes against homosexuals and successfully passed legislation to this effect. He also supported the Federal Marriage Amendment that would define marriage as between a man and a woman. Smith easily defeated his challenger in the 2002 election, but lost the election in 2008. He served as a US Senator from January 3, 1997, to January 3, 2009. 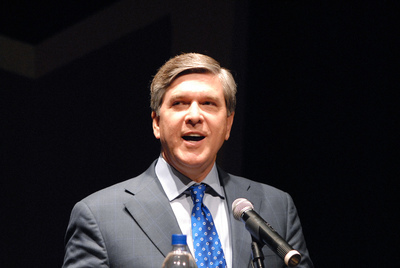 He was appointed president of the National Association of Broadcasters in September 2009. Smith was sustained an Area Seventy (Sixth Quorum]] on March 31, 2012. This page was last edited on 26 March 2017, at 13:42.